Created by bringing together layers of memories from the owners' childhoods and their travels through adult life. The house began as an exercise in pragmatics. 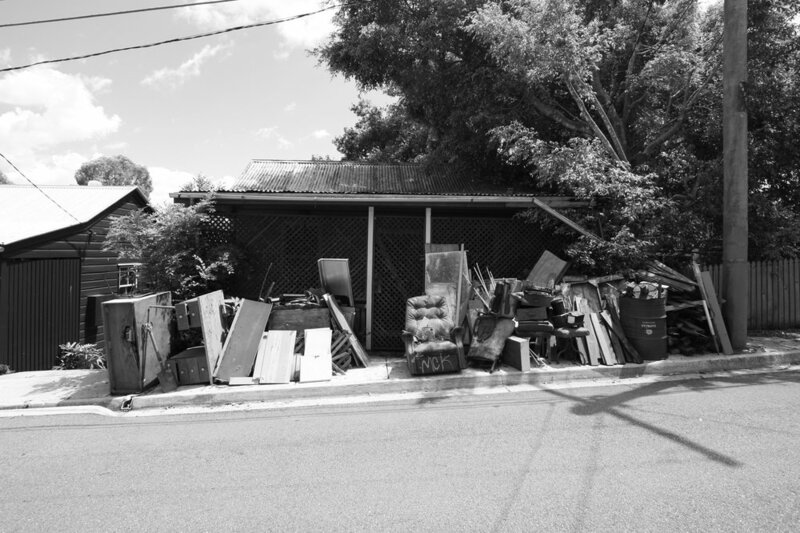 How to manage a number of existing site conditions including the overland flow of storm-water, sewer pipes, easements, planning rules, budget, as well as a 100-year-old cottage that was slowly crumbling into a backyard jungle. 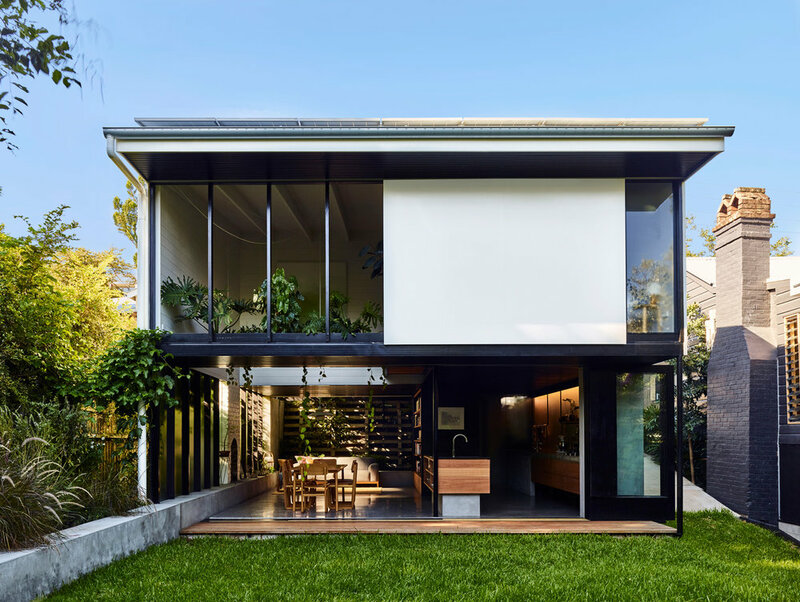 Sitting halfway up the ridge of the inner-city Brisbane suburb of Highgate Hill, the cottage's backyard is oriented perfectly towards the north. Retained on the front boundary, the land falls around 2.5m from footpath to yard. 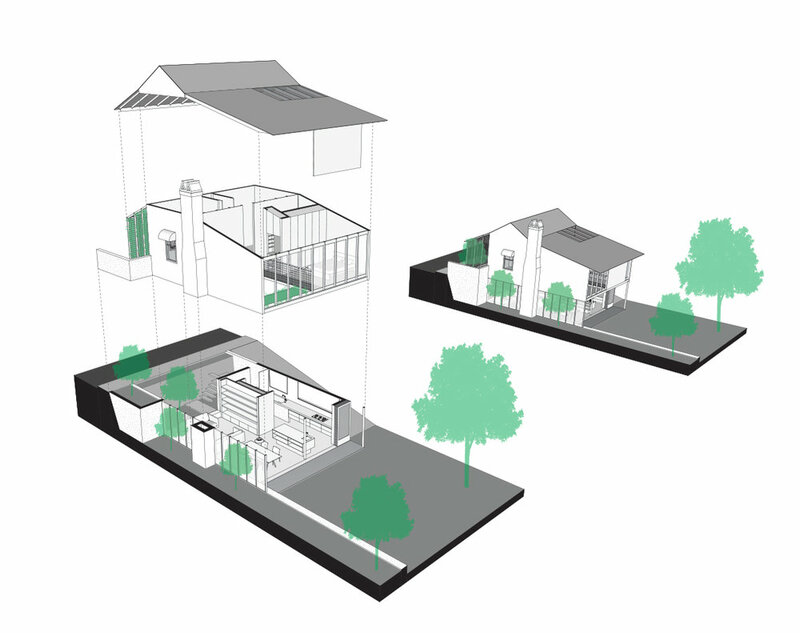 The change in level means that the former one-bedroom cottage could grow by inhabiting the open under-croft below. The streetscape, and the cottage's relationship to its twin neighbour, would remain intact without raising the house. 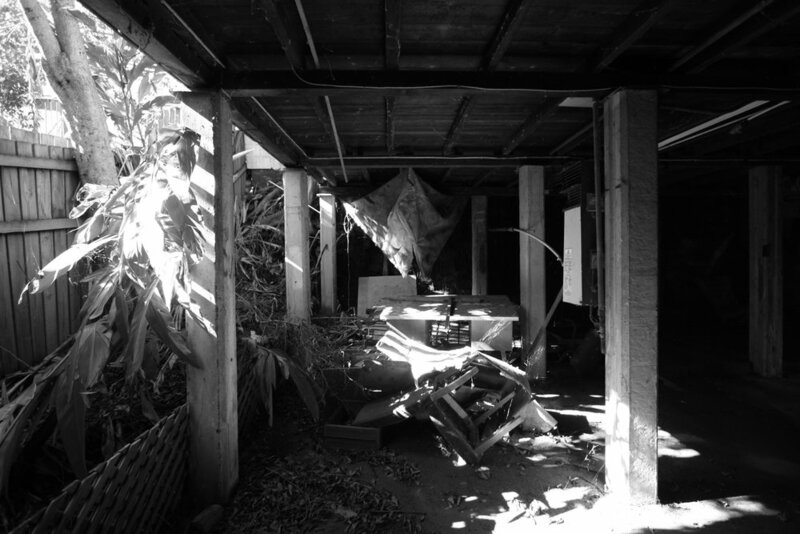 Entering from footpath into a private world through a secure vine-covered screen, the former front verandah now contains protected external stairs. A lush tree and fern filled void draws you down the stairs to the living area below. The lower level with laundry, bathroom, meals and lounge has been designed and detailed to conjure memories of the former shadowy under-croft. Black stained ceilings create compression as you enter from garden in the bottom of the front void. Concrete floors, rendered walls and perimeter ledge make you feel grounded, sitting ever so slightly below the garden level in a breezy cool under-croft, not sure if you are inside or out. The lower level can be enclosed by timber framed sliding doors to the north and south, both of which, when open, become invisible, sliding behind external walls. A solid wall to the west protects the space from afternoon sun. 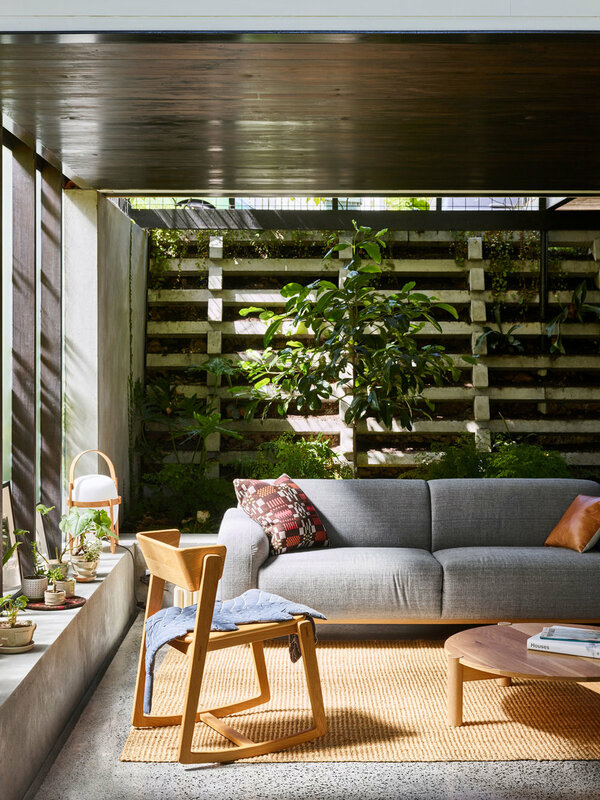 Fine textured glass to the east captures winter morning sunlight, while the lush planting behind casts shadows and flickers dappled light into the living space. Sitting in shadow allows you to retreat from the intense Queensland light. Above are the more private rooms of the house. Access is back up the protected external stairs and inside the original cottage door. The front two rooms open to a common hallway space, making a larger room for children to play and grow up together. For privacy, large floor-to-ceiling sliding panels can close separating, containing and creating a retreat space in these bedrooms. 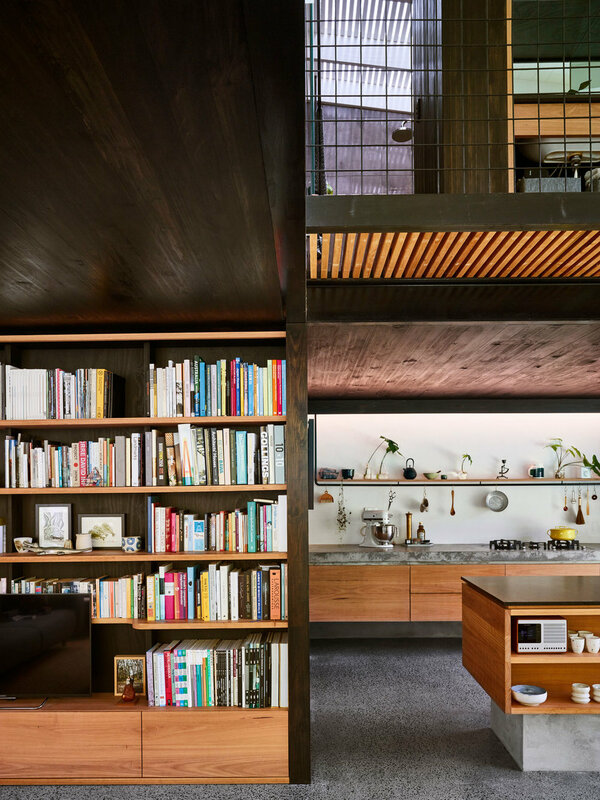 A custom piece of cabinetry serves as a wardrobe, shelving and an extendable bed frame. The resulting space, with nooks for trinkets and treasures, was inspired by memories of a loved childhood home. Off the hallway is a shared bathroom. Like the front entry space, it too has a semi-transparent polycarbonate roof, letting in light and the sound of rain. The vanity and third bedroom sit adjacent to a large void in the rear north east corner of the house. The connection of the two levels enables chatter and activity. Passive surveillance and communication extends to the street from most parts of the house via glimpses through the vine-covered screen to walkers by. From season to season the house can be adapted as required. In winter a large panel slides to enclose the rear void. In summer deep eaves protect the north from the sun. The large panel is left open allowing breezes to flow through the house and out though the screen to the street. Beyond the social and pragmatic aspects of the design, much of the detail in the house is inspired by layers of personal memories. Most are unconscious connections that have only been realised after living in the house. 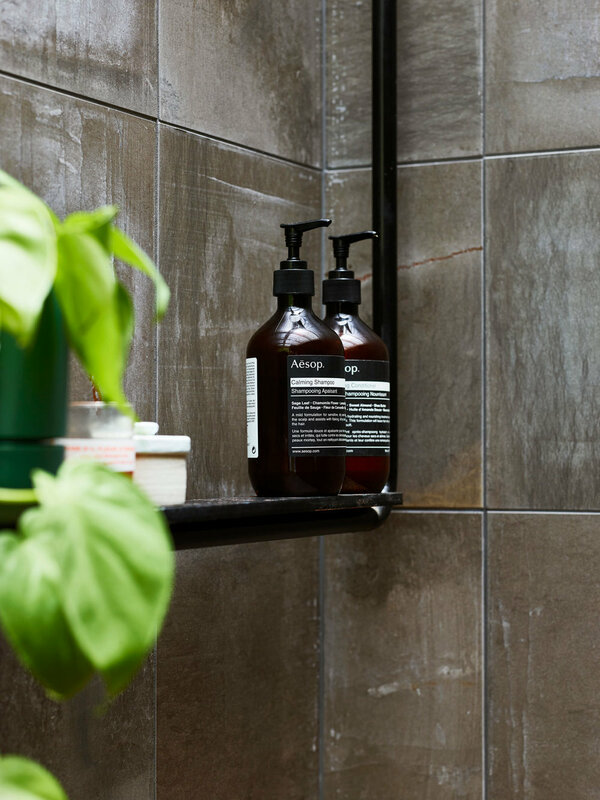 The use of screens to open and divide space and the translucent obscure glass invokes past travels to Japan, while the lush planting, rendered block, semi-outdoor bathroom realises more recent trips to Malaysia and Singapore. A small practice with a love for creating the places people live inspired by travel, memories, landscape, materials and location. Our goal is to create functional and simple spaces that still delight and surprise. Projects have a strong relationship to the client's brief and develop though discussion, experimentation, and the collaboration with other professionals and craftspeople. This becomes part of the design and building process, from start to completion. Educated at the Queensland College of Art, gaining a Bachelor of Design (B.Des) in 2001, John went on to complete a Master of Architecture (M.Arch) at the University of Queensland. Before working in the architectural field, John gained extensive design experience in graphic design, wayfinding & product communication working with a number of multi-disciplinary design companies in Australia and the UK. John is an occasional contributor to Architecture Media publications and the State Library of Queensland's Design Online website.